There are various kinds of places one can visit when he decides to go on a trip. Though, places full of scenic beauty and cultural significance are the first preference, sometimes it is better to visit a place which not many have frequented. Something different, something unique; to give you a grand set of unique memories. Here is a list of the most mysterious places in India and some of the most haunted places in India, which actually deserve a visit. Kalavantin Durg also known as Prabalgad Fort, is located in Maharashtra between Panvel and Matheran. Situated in Western Ghats, it is at a jawdropping height of 2300 feet. 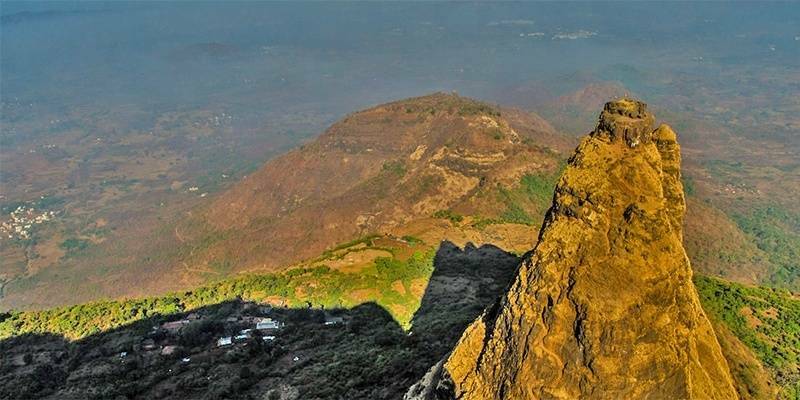 From the top, Matheran, Chanderi, Peb, Ershal and Kernal Forts can also be seen. A distant view of the city of Mumbai can also be seen. It is sometimes referred to as the Climb To Heaven. There is no railing for safety and trekking facilities are widely available. Due to this reason, this fort is a must visit from all the adventure enthusiasts. It is one of the most dangerous forts and trekking should be completely avoided during the monsoon season. Vertigo patients are also advised to stay away. Although, the view from the peak is spell bounding and will surely attract all the nature enthusiasts. The best time to visit is October – May. Lakhpat is a small town in Gujarat which is sparsely populated. Lakhpat used to be a very important trading center in the olden times. However, due to the dam being built after the earthquake of 1819, Indus River’s flow changed and Lakhpat lost its grandeur. Soon it lost its importance and locals migrated to other places. Lakhpat is enclosed by 7 KM long walls of the fort on all sides. 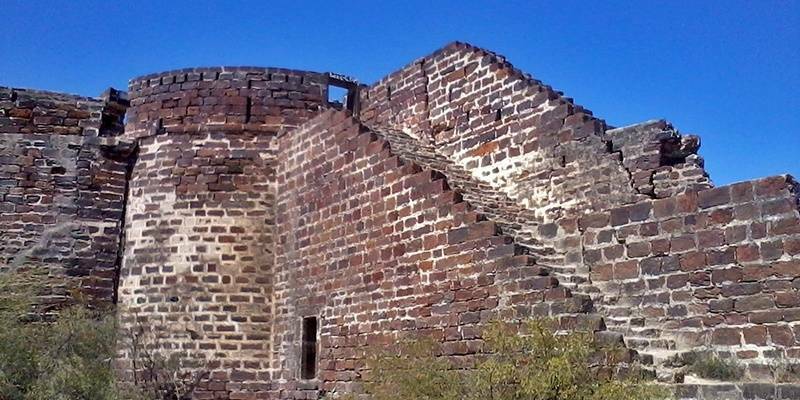 The Lakpat Fort deserves a short visit from all the history buffs and is one of the most mysterious places in India. The tomb of Phir Gaus Mohammaed is another site of attraction. The tank of water nearby is believed to have skin healing characteristics. The Lakhpat Gurudwara Sahib was declared a protected monument. It is said that on his way to Mecca, Guru Nanak rested here. The town is also surrounded by BSF guards due to security reasons. The Bhangarh Fort was built in the 17th century in Rajasthan. Though the fort has been well kept, nobody lives within the limits of the fort as it is believed to be haunted. Archaelogical Survey of India has prohibited any night stay in the fort. There are many legends associated with this fort. It is said that a wizard once fell in love with the princess of Bhangarh and tried to force her to marry him. However, due to an accident, he was killed and while dying, he cursed the fort that no one would be able to stay here. Soon after, Mughals attacked the fort and 10,000 people including the princess were killed. Since then, many paranormal activities have been observed and many deaths have been reported too. It is believed that the ghost of the princess and the wizard are still trapped there. 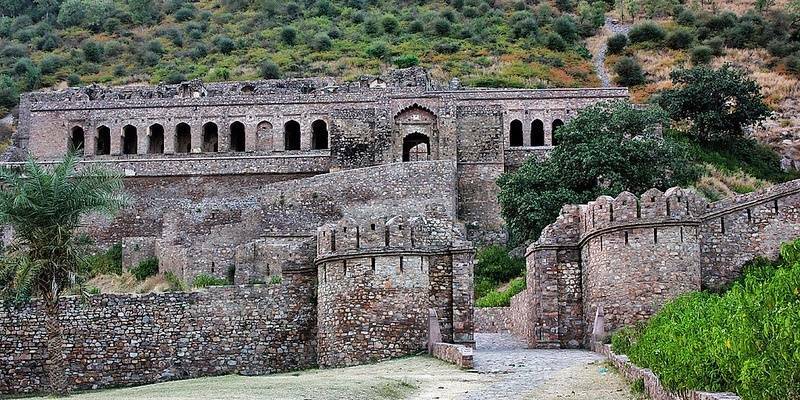 Bhangarh is easily one of the most haunted places in India. There are a total number of 5 gates in the fort. There are many temples and palaces too. They are all elegant looking but nonetheless, give an eerie feeling. Dhanushkodi is a town in Tamil Nadu, India. It is an important Hindu Pilgrimage. It has two main significances in Hindu mythology. Firstly, it is believed that when Lord Ram broke Shiva’s bow to marry Sita, a piece of the bow fell here. Secondly, when Lord Ram destroyed the bridge which he used to go to Sri Lanka, he shot a bow here.This area has frequently been affected by disastrous high magnitude cyclones and storms. The cyclone of 1964 had an adverse effect. A train, which was nearby drowned in the sea with about 150 passengers. The railway station was also destroyed. 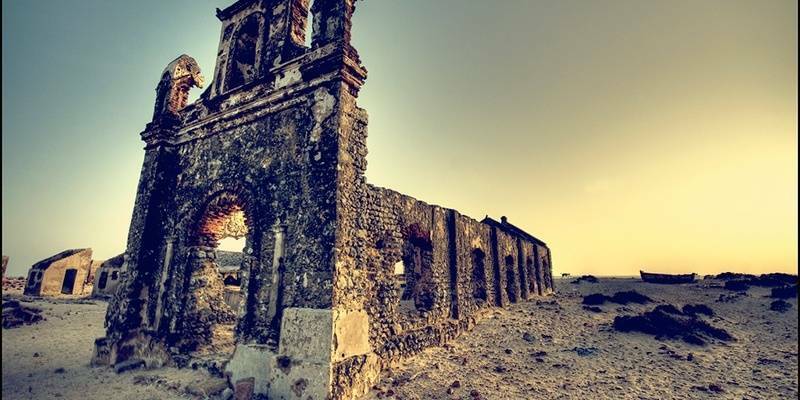 It is recommended to visit Dhanushkodi during the day and then return to Rameshwaram by sunset as this place is considered mysterious and a bit scary and can easily be understood to be a haunted place. Taxis also dont work here after sunset. There is no electricity or communication too. 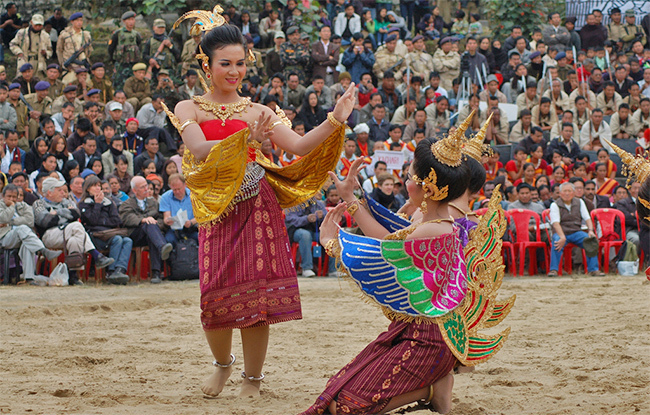 However, the temples are still a popular site of attraction. 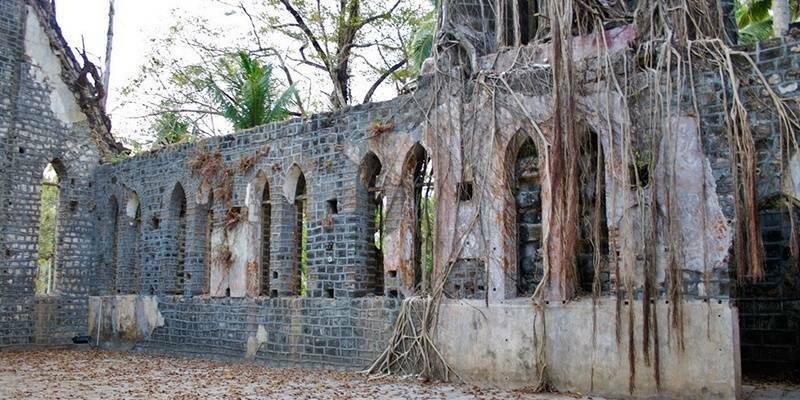 Ross Island is an abandoned island in the Andaman and Nicobar area. It was the Administration Headquarter till 1941 but it was hit by an earthquake which ruined the whole island. 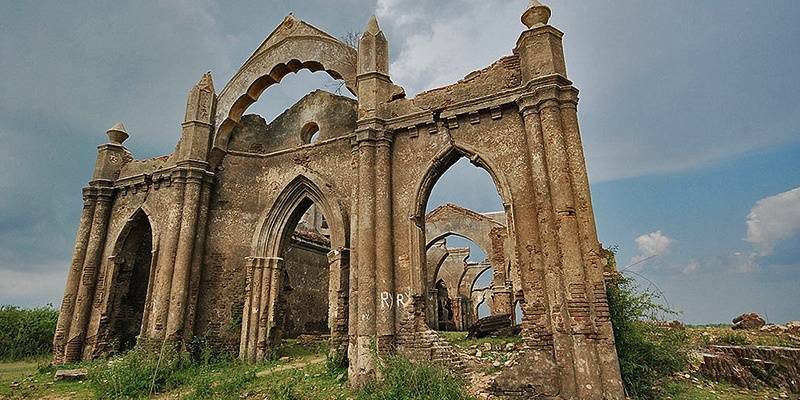 Now only ruins are left of the churches, bakeries and other landmarks. There is a museum which has on display various old artifacts. Ross Island can be easily reached from Port Blair as there are various boats available. A Light and Sound show has also started. The fees for the entry and the show is minimal. The show is not available on Wednesdays. The tickets can be bought on First Come First Serve basis. The view from the Ross Island is magical. It is, like others, covered with forests. Though, the buildings are in ruins yet, the place has been very well preserved and deserves a visit from all the nature and history enthusiasts. Velha Goa is a sparsely populated village in the North side of Goa. It was constructed in 15th century and was the Portugese capital from the mid 16th century. However, it was abandoned in the 18th century when a plague hit the city. 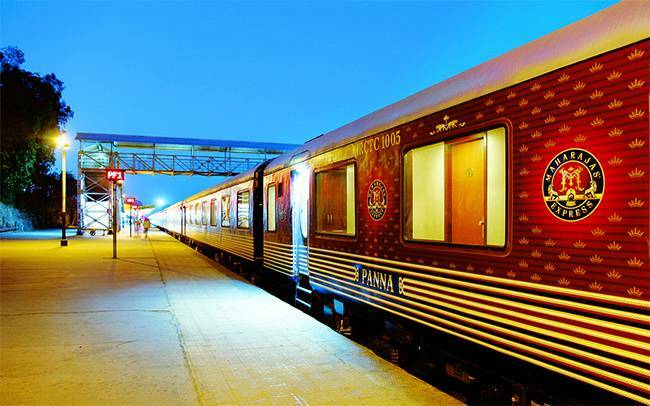 It is easily accesible as it is at an approximate distance of 11 km from Panjim. It is located on the Zuari River and acted as a port in the olden days. 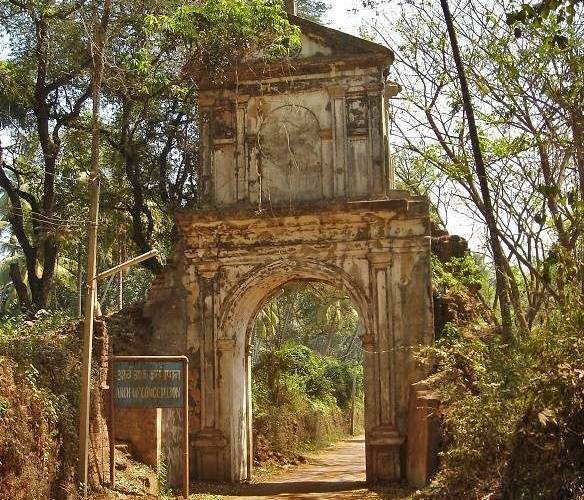 Though, not visited by many, Velha Goa is a beautiful place with some unique history and architecture to offer. There are many churches in this area which are awe inspiring. This place deserves a visit from all the nature and photography enthusiasts. The best time to visit is in winters. Vijaynagar, name of the now-ruined capital city that surrounds present day Hampi is located in the northern part of Karnataka. In around the early 16th century, Vijaynagar was the second largest city in the world. However, when the Deccan Sultanates invaded it, the city was left in ruins. Since then, it never regained its popularity as nobody tried to rebuild it. It is located at the bank of River Tungabhadra and surrounds the Virupaksha Temple. There are hills around, which increase the scenic beauty of this place. Vijaynagar is called the sacred center because of the presence of architectural wonders like, Virupaksha Temple, Hemakuta Hill, Krishna Temple, Lakshmi Narsimha, Sugriva’s cave, Kodandarama Temple, Vittal Temple and the King’s balance. 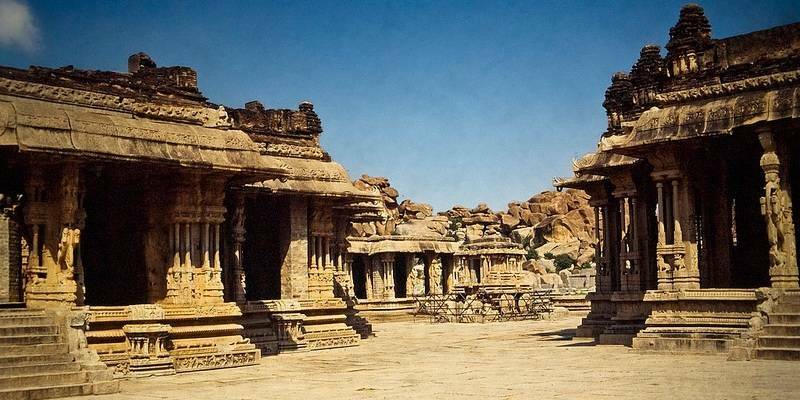 It is also regarded as a Royal Centre because of monuments like, Ramachandra Temple, Underground Shiva Temple, Lotus Mahal, Pushkarani and Elephant Stables. It is not shocking that UNESCO declared Vijaynagar as a World Heritage Site. 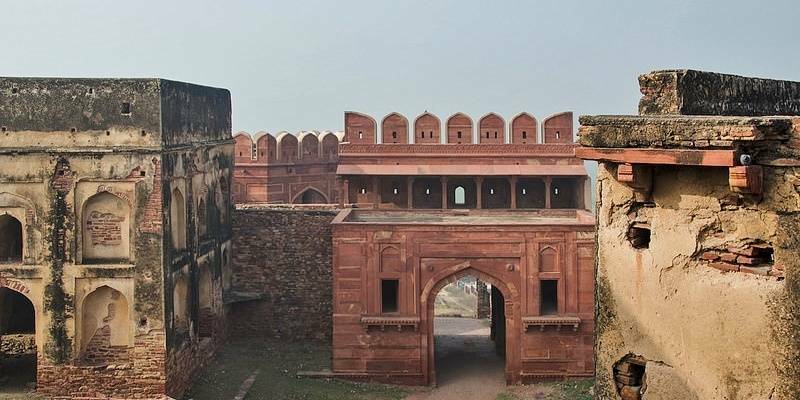 Fatehpur Sikri is another World Heritage Site in Uttar Pradesh. It was founded by Akbar in 1569. It was the Mughal capital from 1570 to 1584. It was built to honor Salim Chishti, Sufi saint. Akbar took keen interest in the architecture of this city. Many legends involving Akbar and his nine gems were born here. Fatehpur Sikri is an architectural masterpiece in itself. Mughal history would be incomplete without the mention of this place. It is a must visit from every history and architecture buff. Majority of the buildings were built out of red sandstone. Some of the most awe inspiring buildings here are – Buland Darwaza, Jama Masjid, Tomb of Salim Chishti, Diwan e Aam, Diwan e Khaas, Ibaadat Khana, Anup Talao, Hujra i Anup Talao, Mariam – uz- Zamani’s palace, Naubat khana, Pachisi Court, Panch Mahal, Birbal’s House, Daftarkhana and Kharkanas. This place can now be called a ghost town but should be visited at least once. Kuldhara is a village in Rajasthan which is considered to be cursed. Paliwal Brahmins lived here in this village which is near Jaisalmer. Approximately 1800 people lived here but all of a sudden, one night, each and every one of them disappeared without any clue. This was not due to any natural disaster or accident. Some believe that the king imposed very heavy taxes and that is the reason why all of them suddenly disappeared to get out of his reach. Others say that Jaisalmer’s Diwan wanted to forcefully marry the daughter of village’s chief. To save her from him, he decided to escape but was scared that he might hurt his village people. Therefore, they all ran away in the dark. When the Paliwals escaped, they cursed the village. Since then, whoever tried to live there, suffered a painful death. Nobody dares to live in Kuldhara. 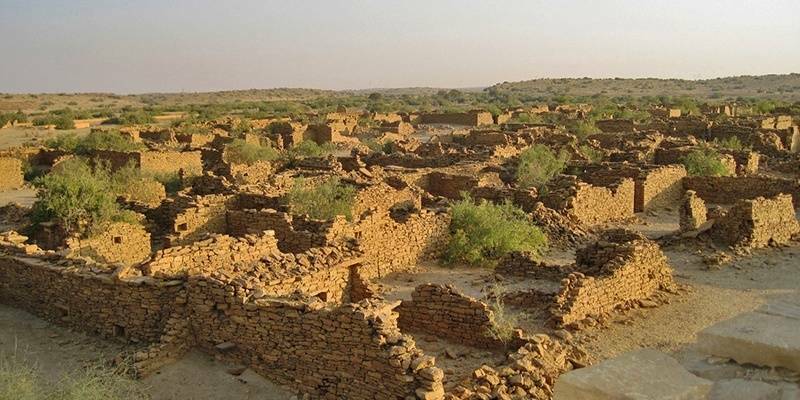 For a long time locals have belived Kuldhara to be a haunted place. However, the sandstone houses are a famous tourist attraction. Shettilahalli Rosary Church was built in 1800s by the French. It is located on the banks of River Hemavathi in Karnataka. Government built a dam on this river in 1960 which flooded the area. During monsoons, the church is literally submerged in water. The water dries out once the rain stops. More than 200 years have passed but the church is still standing erect. Though, it is in ruins, yet it deserves a visit as it is completely fascinating to watch a church which drowns every year but then comes up again. Nonetheless, it is a beautiful piece of architecture. Shettilahalli Rosary Church could easily be the most photographed mysterious and haunted place in South India. However, it will be lost soon because the water has a negative effect on the building material. These places are more recommended for all the adventure enthusiasts as many are haunted or believed to be cursed. Faint hearted should refrain themselves from visiting the haunted/risky places mentioned in the list.